With tips from Erin Conway of @kismet_house. Designer and stylist Erin Conway of Kismet House has a penchant for creating bright, airy spaces that feel layered, colorful, and unique. It doesn’t always come easy, though, and she’s no stranger to tackling some interesting design challenges, thanks to her 1970s beach house’s unique architecture. Conway took over Domino’s Instagram feed to show us how to embrace the eccentricities of your home’s architecture, funky angles, low ceilings, and all. There is so much dimension going on in this corner of Conway’s house, yet somehow it all just works. In this case, a gallery wall draws the eye upwards and accentuates the high ceilings. Instead of becoming overwhelmed by a space that has a lot going on architecturally, focus on one specific area to highlight. Don’t fight it, as Conway says, “embrace the quirk”. Between the angled wall and long, sloping window in the family room, Conway had quite the challenge with her living room layout. 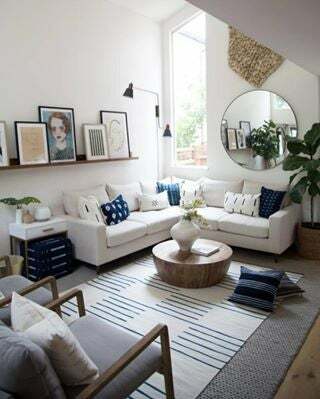 Here, she struck a balance by layering two wall decor pieces (a round mirror and macrame hanging) above one another to draw the eye up and play up the scale of the wall, juxtaposing those with a grounded wood ledge and artwork. Though she addresses this corner as her “Everest”, we’d say she mastered it like only a true pro could. While you can’t exactly change the architecture of your home without majorly investing, you can chose decor that will work with what you’ve got. In this case, that meant selecting seating and storage options that worked with the low ceiling. Conway made the most of what others may have left alone, creating unused space, thanks to configuring the room’s layout in a way that made sense for her family.